A detailed but quick to make up ornament. A strip of even count peyote is mounted around a wood spool. A loop and a fringe of fire polished beads and delicas are then added to create this adorable ornament! This ornament would make a lovey Easter gift or for the special people who loves their rabbits! Around the spool is a panel containing a Spring time scene with tulips and a cloudy bright sky. There are two cute little rabbits portrayed on the spool, one leaping in the air and another holding a tulip. This pattern is fairly fast to bead taking only 2-3 hours in total. This bead pattern is made using Japanese Miyuki size 11 Delica beads and peyote is used. It is assumed the beader will be familiar with Peyote, however Peyote instructions are available free on www.threadabead.com. Please note the pattern may not work with any other size and type of beads. 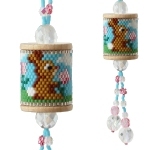 There are 11 delica colours in total and the finished beadwork is approximately 14.5cm x 2.75cm (including loop and fringe work) Each bead pattern is mounted on a Wood Spool - Height 3.2cm x Width 2.1cm (Product Ref: 1943). 11 x 4mm Fire polished Crystal AB, 6 x 6mm Fire polished Rose, 4 x 10mm Fire polished Crystal AB beads are required for the fringe-work. The pattern supplied is 12 pages and includes close up photo of the finished work, a colour chart of suggested delicas, a colour pattern, a numbered coloured pattern and assembly instructions (including fringe-work instructions).